This morning I witnessed a very near miss between a cyclist and a school bus on Park Avenue South (also known as County Road 33). This “bad interaction” would be classified as a “left-hook” where the bus was slowing to turn left, and failed to yield to the cyclist in the bike lane (approaching from the left and behind). Had this crash occurred, it would most likely have been severe, if not fatal for the cyclist. This is the same kind of crash that killed a cyclist on Park Avenue in 2009. It’s always seemed a little crazy to me that some of Minneapolis’ most heavily-used bike facilities are located on streets that are functionally freeway relievers (see Blaisdell/1st Avenue on the west side of 35W). Drivers expect (and marked speed limits encourage) travel at 35, 40 or 45 miles per hour on these routes, feet away from cyclists traveling 5, 10 or 15 miles per hour. Don’t get me wrong, Park and Portland (likewise Blaisdell and 1st) are pretty great bike routes. Given their heavy traffic, they have priority over most cross-streets at intersections, meaning a speedy trip. They’re also huge, so there is space for adequate bike lanes. I don’t know what the ideal configuration is for bikes and cars on these two one-way pairs, but as Hennepin County prepares to repair and re-stripe Park and Portland this summer, I think it’s a good time to think about how both of these pairs could be made safer and more inviting for cyclists. In fact, Hennepin County’s Complete Streets policy actually requires them to assess all road projects for inclusion of Complete Streets features and “integrate innovative and non-traditional design options”. Do these streets need to be one-ways? Park/Portland and Blaisdell/1st became the one-ways pairs we know today to address traffic capacity prior to the construction of the freeway system. Well, we have a freeway now (and a newly widened one at that), so I think it’s time to reassess this configuration. Blaisdell at 40th sees 2,800 AADT, hardly two-lane one-way street territory. Access Minneapolis, the adopted citywide transportation plan, specifically identifies the Park/Portland and Blaisdell/1st Ave one-way-pairs for evaluation and eventual reversion to two-way streets. Two-way traffic would mean slower traffic, and better streets for bikes. Two-way streets also might allow more space for a “multi-street” solution (see #5). Do these streets need to be three lanes wide? At any time other than rush hour, three lanes are way too many. This encourages speeding (see #1) and wastes space that could be used for other modes. Hiawatha handles similar and greater traffic volumes, and is only two lanes in each direction for most of its length. Do we need on-street parking on both sides of the street? Park and Portland have parking on both sides. Losing parking on one side would free up a lot of space to better incorporate bike and ped facilities. Is there space for an “innovative” solution? Hennepin County is already apparently considering moving the bike lanes on Park/Portland to the right side of the street, which is a good start. But what about “buffered” bike lanes (paint, bollards, etc)? 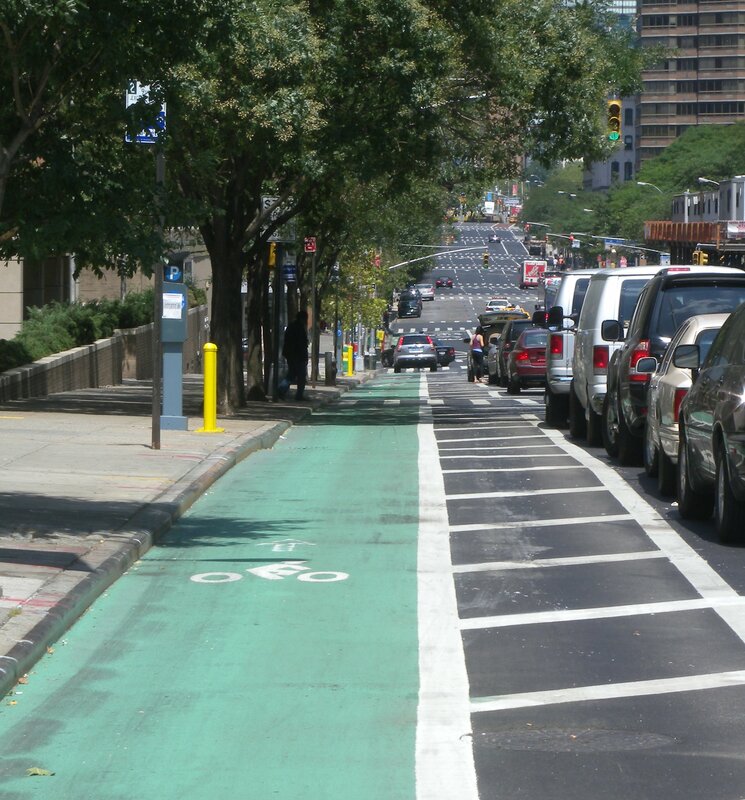 What about putting the row of parked cars between moving traffic and the bike lane? How about a full-on cycletrack? New York and Chicago have some great examples of protected facilities on very busy streets that use just paint and parked cars. With one less row of parking, I’m sure Park and Portland could each fit a wide bike lane and a 6-foot buffer between the curb and a rowed of parked cars. How about a multi-street solution? I’ve outlined a multi-street solution to providing a segregated two-way bike facility on the Blaisdell/1st Avenue pair at Net Density. If Park and Portland were both two-way (or one two-way and one one-way) perhaps both a segregated two-way bike facility could be used on one half of the pair while the other reverted to all-car. Maybe we could develop one really excellent two-way facility on 1st Avenue south (an at-grade Greenway perhaps)? What do you think? Do you ride or drive on Park and Portland? Are you one of those traffic engineer people who can tell me more about lane widths and design speed and why we’ll eventually be told we can’t have nice things? Let me hear it (here’s something from twitter to get you started). At present, according to the Minneapolis Bike Coalition, Hennepin County doesn’t seem interested in anything beyond moving the bike lanes to the right side of the street. If you’d like to see something different on Park and Portland, contact your County Commissioner, contact the MBC and contact your City Council member. Brendon is a professional planner and Sustainability Program Coordinator for the City of Minneapolis. He has a degree in Urban and Regional Planning from the Humphrey School at the University of Minnesota. When not at home in southwest Minneapolis, he may be catching trout or riding a bicycle. You can find his blog at netdensity.net and you can follow him on twitter. His views are his alone, and do not reflect those of his employer. Another benefit you forgot to add is the effect on the surrounding community and it's property values. There are so many grand and beautiful homes on Park and Portland, but nobody wants to live next to a freeway. These avenues have such potential to be monumental boulevards like Summit Ave or Linden Hills Blvd. Ultimatey there is an incredible potential to revitalize these streets and return them to what they once were, but I have a sneaking suspiscion that Hennepin County lacks the forward thinking and common sense to make this happen. I've been thinking a lot about Park & Portland lately and going out of my way to ride them more often. I also ride southbound on Blaisdell several times a week. My experience with these roadways is mostly limited to areas north of Lake Street, but I did drive up Park once from 46th all the way into downtown just to see what it was like. I don't see Blaisdell/1st and Park/Portland as equals. Park/Portland are much wider roads and their posted 35mph limits are frequently exceeded. Auto traffic speeds on Blais/1st seem much closer to the posted 30mph (again, only speaking to north of Lake St). I see Blaisdell and 1st more as quicker alternatives/relievers to Nicollet and probably should be preserved as one-way pairs for the foreseeable future. For one, Nicollet from Lake-40th will be under heavy construction the next two years, plus there's the ever-looming streetcar/rapid bus implementation that will push a lot of traffic onto Blaisdell/1st. Park and Portland are a whole different animal, and your timing with this post is great, as I'm planning on meeting with CM Lilligren soon to discuss this very subject (as well as streetcars and a bunch of other transportation geek things). If P&P are maintained as one-ways, I'd love to see them knocked down to only 2 thru-lanes, plus turn lanes and bumpouts where necessary. Most of the way into downtown, Park Ave has 3 thru-lanes, a bike lane, and very comfortable parking lanes on both sides of the road. There's just so much ROW…I don't know what to do with it all! It seems that turning them into two-way streets would be the most beneficial thing to do for the neighborhood. Along with reducing the speed limit to 30…that should happen now. More important than improving the bike facilities, I think, is rebuilding these road to improve the livability of the neighborhood. Making the traffic slower and safer, by reducing the crossing distances (actual or perceived) should be priority #1. Onto the subject of bike lanes on one-way streets. There has to be a "best practices" rule for this or something. Personally, I prefer riding on the left side of a one way street, except when I have to make a right turn. But most of the time, riding on the left side of a one way feels safer. I always ride on the left-hand side of W. 28th St, perhaps because cars are parked on that side, perhaps because I live on that side…who knows. There are several examples downtown of bike lanes on the left. Whatever is decided, I feel that consistency is key, so that people like me know which side to ride on when there are no bike lanes. Sorry for rambling, I'm just had a lot to say about these roads and I'm glad you posted this. Unless there's a dedicated bike lane (such as on P & P) isn't the law that bicyclists are supposed to ride on the right-most lane except for passing others? Used to be that the signals on Portland Ave were timed for 37 MPH. Has this changed? Yep they are timed at about 37 MPH… I drive it every day. I agree something needs to be done with these streets. This morning, I saw a pedestrian perilously waiting to cross Park at 27th. Last night, I saw someone going at least 55 MPH down Portland (but of course the timed stoplights meant most traffic going 35-40MPH caught up to him!). I also frequently see where bicyclists want to pass one another but it usually means the faster bicyclist having to get dangerously out on the edge of the left hand traffic lane. These roads are empty except for at peak rush hour, and they could definitely afford a road diet. And except for when the roads are congested during peak travel, people see a wide street as a reason to drive fast. I don't know if everyone who drives grossly above the speed limit is actually intending to show contempt to those who live on the street; the street is just designed for this. I've played with the ROW a little in the past, thinking about how Park and Portland could be improved. Two-way streets are an option. Or what if one street was kept as two-two plus a parking lane, and the other was set up more as a parkway with a green median that serves as a pedestrian refuge. I actually think we need plenty more medians for this purpose all over S. Mpls. I've always considered Park Ave a good candidate for a county turnback project. Portland has county significance, since it crosses the parkway, TH-62, 494, and extends all the way through Bloomington. Park, not so much. The wide ROW on Park could certainly allow us to do something creative that would add value to the community. This might include medians or some kind of fancy bike lanes. Converting to two-way traffic is certainly a much bigger undertaking than the planned restriping project can accomplish (every signal along both corridors would have to be re-built), but I think it should certainly be our ultimate vision. A pair of streets that are just like Park and Portland with many of the same problems are University Ave and 4th St SE. I'm in favor of them getting changed to two-way also. Certainly these streets need something more substantial than switching the bike lanes to the right. "Do we need on-street parking on both sides of the street?" If I lived on Park or Portland, I'd say yes. Most households have a single-car garage and more than one car. And visitors. A lot of the same reasons that make them less safe streets to bike make them less safe streets to park on the other side and walk across. It's way too residential to force people to make do without that parking like you could get away with in a more dense/developed area. I agree with you, but if I lived on Portland or Park and had the choice between the status quo and a street that had a sense of place and was accommodating to bikers and peds, I'd definitely choose to give up a lane of parking for the right solution. Swapping out a traffic lane for accommodating bikers and peds is a better trade-off, here. Three lanes is much too much. Residential neighborhoods with multifamily homes along much of the stretch have greater need for on-street parking. Although — Park and Portland aren't monolythic in their character, and giving up parking further south (of Lake? Of 34th?) makes more sense than north of Lake. Of course right now we have a lot of space because the roads are one-way, and removing a lane of traffic would be no problem. But if they are switched to two-way that would change. Use some of that right of way to add greenery to the middle of the street — traffic calming, pedestrian refuge, and beauty that improves the appeal of the street dramatically. The connection between the future Portland Avenue bike lanes south of the creek do not connect well to the existing bike lanes. When I lived south of the creek for a year, I used the Park & Portland bike lanes regularly, taking 57th westbound to Portland, northbound on Portland to 46th Street, eastbound on 46th back to Park Ave and Park Ave northbound to downtown. It was worth going west over to Portland and back on 46th since it is much flatter than any other alternative and I avoided the hills around the creek and Chicago Ave. Adding some kind of sharrow & bike box on 46th would help formalize this connection. Crossing from the left lane bike lane back to the right just before 46th felt awkward. I was- basically waiting for a break in traffic and then crossing 3 lanes diagonally. I never left work before 6 or 6:30 pm when biking so I could do this without too much traffic going home. My concern with turning the streets back to two-way is that the bike lane "solution" could end up looking like Hennepin Avenue downtown. Unless it's clear that a better bike lane design can be accomplished with a two-way roadway, there will be more flexibility in bike lane design with two one-ways. Finally, adding in some separation between car traffic and the bike lane on Park & Portland is really necessary. It's pretty scary to be two feet from cars going 35-40 mph. Yet, I still drive that speed (when not passing adjacent bicyclists), so I can keep up with the lights. Ideally, a fully protected cycle track with proper intersection design would be the best option. Two feet of painted striping as a protected buffer (similar to 1st Ave) should be the minimum. I bike or drive these routes almost daily, often, but not always, at rush hour. Perhaps the most striking idea to me is the suggestion that Portland and Park do not need to be three lanes. Yes, they are heavily used during rush hour. By 6:30 p.m., however, traffic is sparse. If officials are unwilling to make these streets two-way, I'd love to see the lanes of traffic reduced to two and the bike lane widened. This would allow cyclists to maintain a safe distance from both car doors and cars. It would also allow enough space for cyclists to pass each other. As the weather has warmed up this spring, I have witnessed the problem of cyclists going 15 miles per hour attempting to safely pass those biking 5 mph on these routes. I'm thrilled to see so many people bike commuting, but it is problematic nonetheless. Also, any changes to bike lanes on these two roads need to take Greenway access into account. I currently have to cross three lanes of traffic to access the Greenway from Portland. Of course, if the lanes were switched to the right side of the street, I would have the opposite problem on Park. I'm not a city planner, and I've never biked anywhere with cycletracks. However, if the county is looking for the minimum they can do to improve cycling and pedestrian safety, I think a wider bike lane with room for passing would make a big difference in my commute. I get a bit frustrated with these discussions about Park and Portland, because I personally find them very convenient for travel inside the city. Arguments that, for instance, 35W serves the same purpose only makes sense to me if you live outside Minneapolis – 35W is not a good way to travel around South Minneapolis. Frankly it feels like suburban intuitions applied to city situations, and a general disinterest in urban mobility. But besides that, I'm also annoyed at the proposals to turn these into two-way streets. What purpose would that serve? There are arguments that two-way streets make it easier to navigate an area, but we are all very well acclimated to these streets and know how to navigate. There are very few businesses on the streets, so keeping customers from being confused as they approach stores is not important. For pedestrians and bikes a one-way street is far easier to cross; you need only wait for a light and there will be a break, something that does not reliably occur on two-way streets. Most bikers who are traveling down one of these avenues is not actually going to a destination directly, so they are not forced to loop around or go against traffic to get to their ultimate destination. There are opportunities to do interesting things with Park and Portland, but turning them into two-way streets significantly reduces those opportunities. It makes them more crowded and more complicated. Right now you could reduce those roads to two lanes with very little adverse effect on mobility, but with two-way streets and the then-necessary left turn lanes you'd have much less room to work with. I haven't read much research on this, but I think the idea is that two lane streets would add some visual friction to cars using the roads and slow them down. The signs may say 35, but the design speed of that road must be at least 45-50. I think removing a traffic lane to create cycle tracks or buffered bike lanes could work really well and allow P/P to still be relatively fast-moving one-way streets, though.